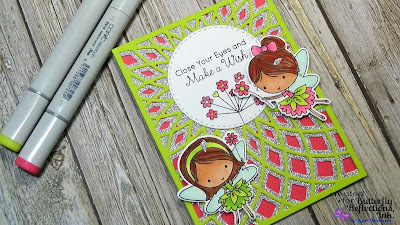 This card features the adorable set from MFT called Fairy Happy, and of course there are Coordinating dies for this set as well. What I love about MFT dies is there isn't any dies that are nested within one another. I love how they do this with their manufacturing. From this set, I chose to color both of the fairies, as well as one of the flower clusters, and I colored them in with my Copic Markers - I used several colors - RV02, RV13, RV14, RV34, R20, E11, E13, E25, E09, G24, G19, YG03, YG21, BG10, and BG11. To create my background, I used the Dazzle Layering Die set from Birch Press, and die cut some Raspberry card stock, Cilantro card stock as well as some Silver Sparkle card stock to create the three layers. I love how all three of these layered together - like I said - very girly!! 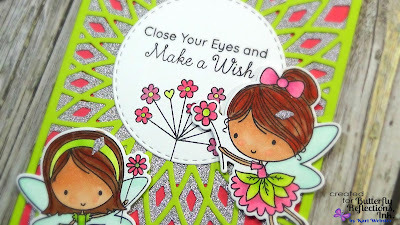 For my sentiment, I die cut a stitched circle from smooth white card stock, and stamped down my sentiment using Jet Black ink from Lawn Fawn as well as the flower cluster, and colored them in with same pinks and greens I used on the fairies. I used some foam adhesive to give the fairies some dimension. I had a lot going on with this card, but I wanted to add a bit more "bling" to my fairies, so I had some of the silver sparkle card stock pieces left from die cutting the background, and used two small pieces and embellished both of my fairies hair. I think it was the perfect addition!! This card definitely does not lack on shine and shimmer!! 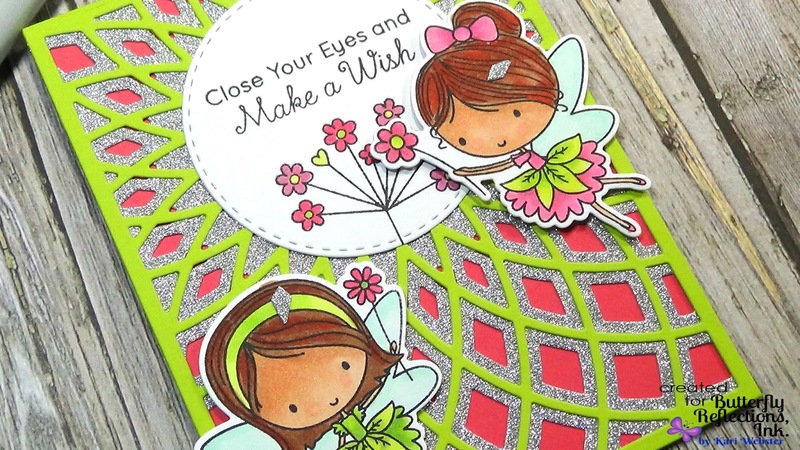 And, I love these fairies, as they remind me of my favorite childhood character Herself the Elf! Thank you all for stopping in once more, and for my crafty friends here in the States - I wish you a Happy 4th of July!! Take care, and I will see you again next week! !